Computational elastohydrodynamics, a part of tribology, has existed happily enough for about fifty years without the use of accurate models for the rheology of the liquids used as lubricants. For low molecular weight liquids, such as low viscosity mineral oils, it has been possible to calculate, with precision, the film thickness in a concentrated contact provided that the pressure and temperature are relatively low, even when the pressure variation of viscosity is not accurately modelled in detail. Other successes have been more qualitative in nature, using effective properties which come from the fitting of parameters used in calculations to experimental measurements of the contact behaviour, friction or film thickness. 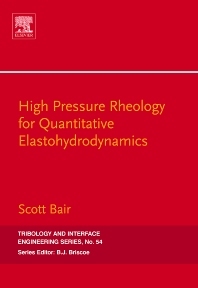 High Pressure Rheology for Quantitative Elastohydrodynamics is intended to provide a sufficiently accurate framework for the rheology of liquids at elevated pressure that it may be possible for computational elastohydrodynamics to discover the relationships between the behaviour of a lubricated concentrated contact and the measurable properties of the liquid lubricant. The required high-pressure measurement techniques are revealed in detail and data are presented for chemically well-defined liquids that may be used as quantitative reference materials. Presents the property relations required for a quantitative calculation of the tribological behaviour of lubricated concentrated contacts. Details of high-pressure experimental techniques. Complete description of the pressure and temperature dependence of viscosity for high pressures. Some little-known limitations on EHL modelling. Scott Bair received his Ph.D. in mechanical engineering and is currently a Principal Research Engineer and Director at the Center for High-Pressure Rheology at the Georgia Institute of Technology, USA. In 2009, he was the recipient of the International Award for the highest honor given by the Society of Tribologists and Lubrication Engineers. His main research areas are tribology, rheology, properties of liquids at high pressure, and machine design.